This post is part of an on-going series, exploring daily creativity via the 64 Arts. So, when we left off we were discussing the 48th art: decorating chariots with flowers. Modernizing a bit, we chatted about car care and accessorizing. That’s about as far as most folks are tempted to go with personalizing their chariots du jour. Some might go as far as pricey aftermarket upgrades, souping up the motor (do people still say souping up?) and adding all sorts of neon and led accents. Now, thisÂ could be the property of the university, but it doesn’t show any specific insignia or department info from this angle, so I’m voting personal. 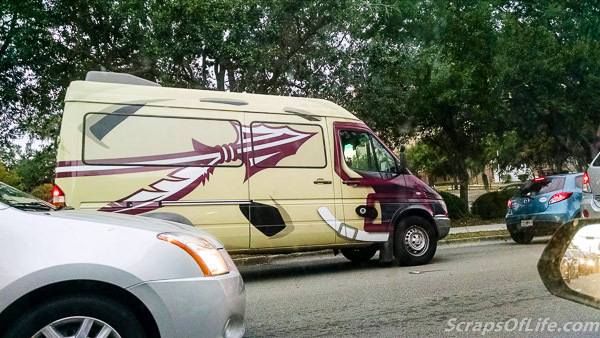 It’s obviously a professional job, involving the same car wrapping technology that advertising vehicles use. So does this count as an art car? Maybe. This is also a professionally-done application, but it was designed by the owner. Does the owner being a professional artist make a difference? Maybe, maybe not, but for someone without the skills or time (or both) to take up the challenge, it’s a good middle option. 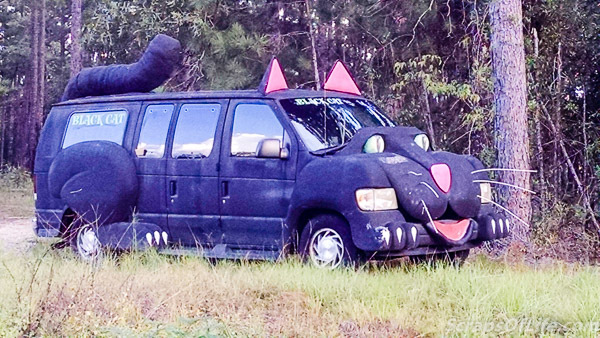 This is the Black Cat, a van that has been heavily modified by its owner, not just with paint but with sculpted additions to the body. I pass this charmer every day on my way home from work, where it sits smiling on the top of a small hill along Hwy 319 in Grady county. Condition of the motor notwithstanding (I have no idea how long it’s been there or why it was constructed), the Black Cat appears to still be drivable–the lights, windshield, and mirrors seem to be unencumbered–but it’s obviously not as aerodynamic as it used to be with the ears and tail additions. These sorts of modification (my research shows) are often accomplished with common hardware store items like spray foam (that is then sanded into shape) and flexible air ducts (which is what I suspect the tail to be). After all, not many people have access to fiberglass modelling set-ups and welding on steel adds to the weight of the car–something you don’t want to do willy-nilly. Other art cars are made such by the sticking on of tchotchkes or other 3-dimensional items, but most common are the painted ones. 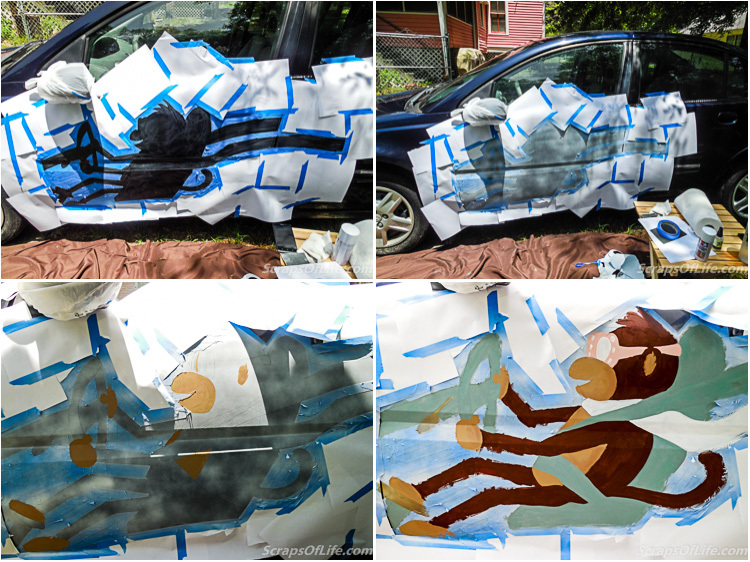 A friend of mine who hails from down in the Keys (where art cars are very common) says that a lot of artists use regular old house paint on the cars. Sounds funny at first, but it makes sense: house paint is meant to stand up to all forms of weather and is available in fairly large quantities for less than the same amount of craft or specialty paints! 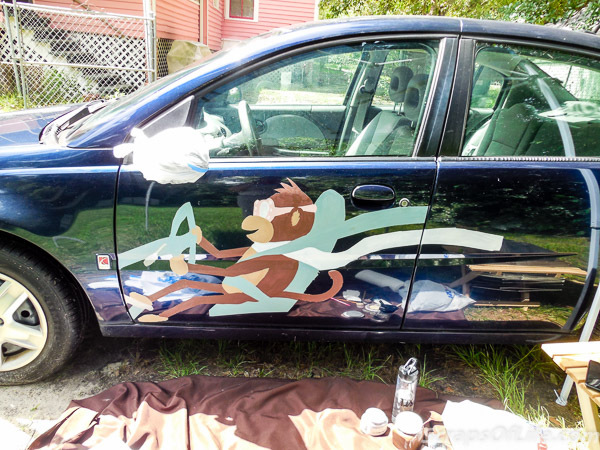 But when I decided to turn my 2007 Saturn into an art car, I wasn’t planning to cover the whole thing in paint, so I opted to use some things I had on hand, and others picked up from Hobby Town, intended for painting models. 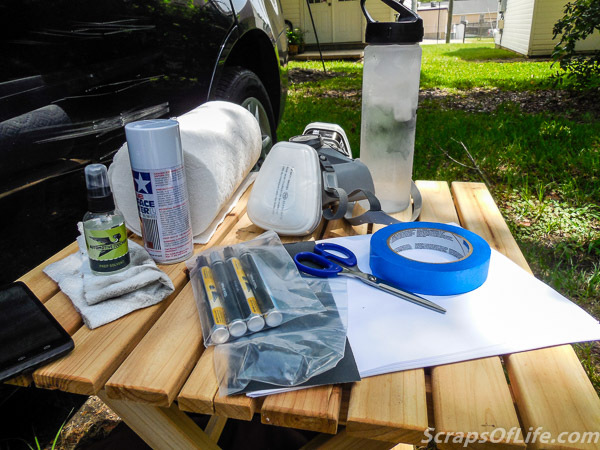 I wore the half-face respirator for anything sprayed or sanded–safety first! It’s important to understand that my car is completely paid off and I have no intention of trading it in to buy a new car. 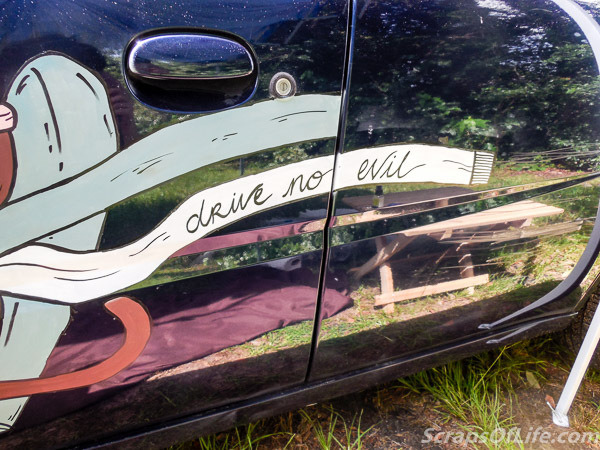 Art cars are like altered books in this way: only alter them if you’re 100% sure it’s not worth a mint 😉 A few years ago I had a run-in (or, rather, a slide-by) with a concrete pillar in a hospital parking garage, leaving a series of scratches on my rear driver’s side door. I thought I’d buy the touch-up paint, fix it, and go on with life. Three guesses as to when I got around to that. Instead, by the time I’d come up to Art #48, I was thinking it would be fun to do something to incorporate the scratches into a bit of art. 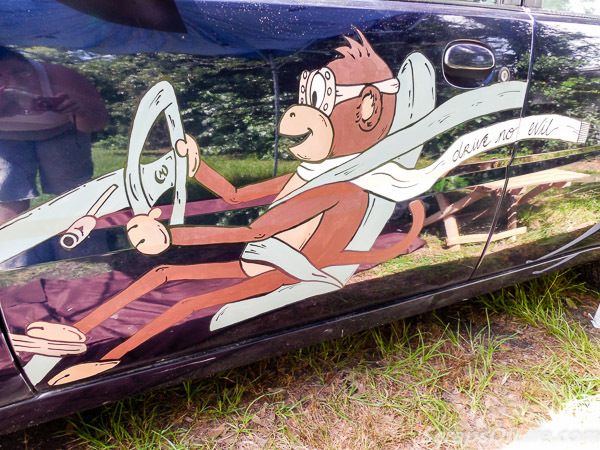 And if there’s one motif I’m fairly committed to, it’s monkeys, so putting a cheeky monkey co-pilot on my door seemed like the best idea ever! Surface preparation is really key, here. Even an 8-year old car is still going to have a fair amount of protective coating left (clear coat, years of waxes, etc.) and your paint isn’t going to stick too well to it. No sense spending all this time painting something awesome only to have it flake off immediately! Stay hydrated, stay shaded, and have something around to keep you company–be it tunes or an audio book. First I cleaned the car door to remove any surface dirt, etc. After deciding what, where, and how big my design was going to be (sketching it out on a large sheet of paper and cutting it out as a guide), I taped off the area around the design (just like you would a wall, only with a few more angles involved), then used some 800 grit sandpaper to rough up only the area to be painted. Dust from the sanding will get in the way of the paint, so another wipe-down is called for, then applying a primer coat. I used a hobby paint primer by Tamiya. Now, priming is totally optional, but since I’m painting light colors on a dark surface, the white primer layer saved me from having to paint a second layer of everything. Furthermore, the primer adds more tooth to the surface, meaning my design has a better chance of really sticking around. Which means there’s less of a chance of my holiday day-off being a total and complete waste! Once the primer had set, I went back with a pencil to sketch in the interior lines. I know plenty of people would just go to town with the paint at this point, but regardless of if I’m working in a sketch book, on canvas, or on a car, a sketch layer is my safety net: it’s where I work out details and create my map to the finished work. I was a little worried that the main paint I was using (Tamiya acrylic, from Hobby Town) might be rather thin and runny. It certainly didn’t have the body that bottled or tub acrylic paints have, and I was worried about drips. Until I put the first stroke on. Not sure if looks were merely deceiving or if it was the heat outside/on the surface of the car, but the paint dried almost immediately. Not only that, it went on stronger than expected from its liquid state and covered like a dream. Again, I give the primer some credit, but this paint rocks for detailed car painting. Since it took next to no time for the paint to dry, the painting went quick. In fact, I think it took just as much time to do the decorative bits as it did to do the physical prep–2 hours each, with a 1 hour lunch break while the primer cured. The painters tape came up like a dream and I was left with a lot to show for my day’s efforts so far! I wasn’t quite done, yet, I still needed to outline the whole thing and add details. Rather than fiddle with a brush for this step, I stayed firmly in my illustrative comfort zone and used an enamel paint pen to do the detail work. Not only did this add definition to the interior spaces, it also served to clean up any edges that needed it (tape only does so much, especially on curves). 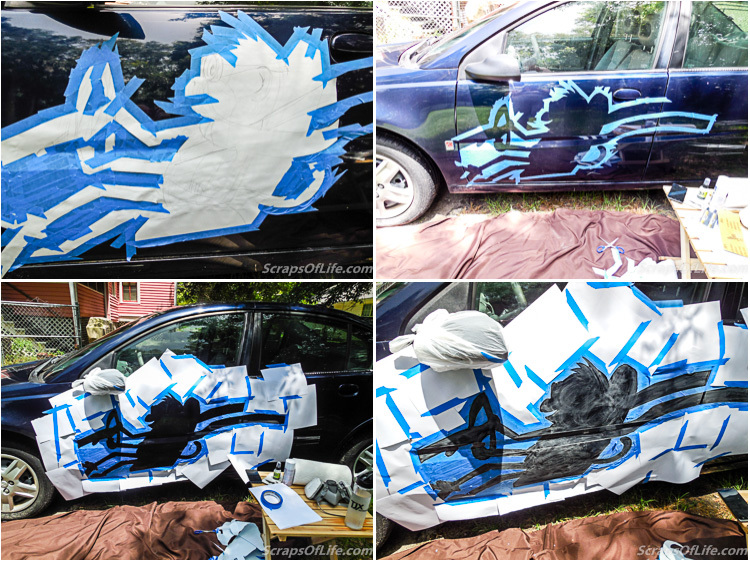 I used black, but you can also buy touch up paint pens in your car’s native color if more camouflage is needed. I’ve gotten some questions about the message on monkey’s scarf. There’s really no “story” to it, other than a take-off of the three wise monkeys see/hear/speak no evil. It just seemed appropriate. Final steps before packing it in for the day were another wipe-down to remove any dust or over-spray that might have occurred, and then a good coat of a clear varnish. 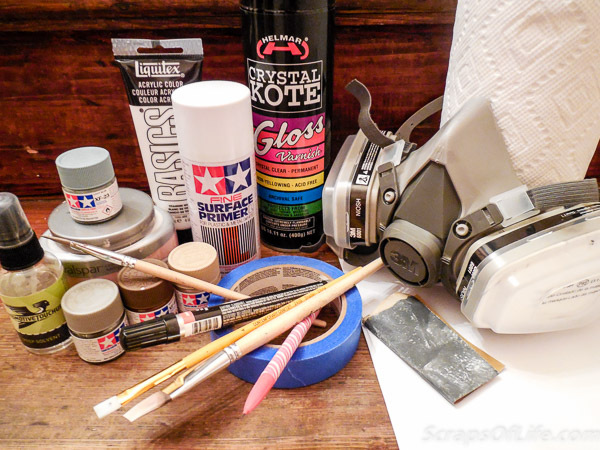 I opted for Helmar Crystal Kote Gloss spray varnish*, intended to put another coat on after 4 hours, per the instructions on the can. Too bad it started raining after 3 hours, but it didn’t seem to affect the varnish at all: no clouding or anything you might expect. Again, I think the heat of the day helped! So far my bit of creative expression is holding up nicely. It’s rained several days since painting it, and when it’s not raining, it’s been hanging around the 90s, so heat and rain haven’t presented any issues. I can always touch it up when and if it becomes necessary, or maybe I’ll decide to do something else entirely down the line. My boss asked what I was going to put on the other side, and I’m still not sure I will put anything there. But who knows? Would you ever want to drive an art car around?